When it comes to the Venice Architecture Biennale, Scotland has always had to think creatively. How does a small country, with no permanent pavilion and a limited budget, begin to engage on this crowded international stage? 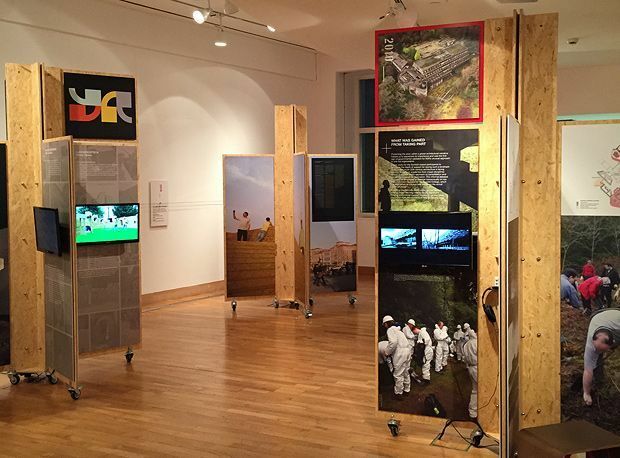 This exhibition, which showcases the five projects Scotland has mounted at the Biennale since 2004, illustrates the different approaches taken to the problem. Landforms (2004), curated by the Lighthouse, was an exhibition shown within the Biennale hub at the Arsenale. In 2008, Gareth Hoskins took things out into the city with a wooden staircare positioned near the main railway station, a focus for attention and events. Two years later, the approach was entirely event-based, drawing an international audience to a symposium to discuss NVA’s plans to partially restore St Peter’s Seminary at Cardross, regarded as a modernist masterpiece. In 2012, four young architectural practices set up a 'studio' in the city, filming it from a low-flying helium balloon and creating a play-build area for children. The 2014 project, Past + Future, collated significant documentation of lesser known modernist buildings in Scotland into five limited edition newspapers which were handed out from a table in front of the British Pavillion. Packed with ideas and buildings, from a football stadium in Galashiels to an unbuilt crematorium in Kirkcaldy, these contain ideal raw material for an exhibition, but the resources here are limited to showcasing the newspapers themselves. Attempts have been made to update the projects: the 2012 practices describe how their time in Venice has influenced their work since, and St Peter’s is now the subject of a major funding bid. But the material can’t hide what it is: documentation of events which happened some years ago. Taken as a whole, the show documents well the diverse approaches to the Biennale conundrum, but leaves one with the sense of looking at photographs from a long-gone party one might have quite liked to attend. A look back at the last ten years of Scotland's contribution to the Venice architecture Biennale. Presentations and contributions about Scotland's contribution to the Venice architecture Biennale.